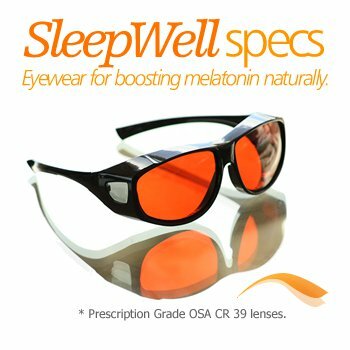 Support natural Melatonin Production with SleepWell specs - Free worldwide delivery, buy online from PharmacyDiscounter.com. SleepWell specs work by regulating exposure to disruptive wavelengths of light in the hours leading to bedtime. Research has shown SleepWell specs could help to restore balance to circadian rhythms and boost natural melatonin production, which may resulting in a better, healthier sleep. Learn more about the sleep hormone Melatonin. Due to increased drowsiness, do not drive or operate machinery 5 hours after wearing SleepWell specs. Additionally, SleepWell specs must not be used while driving or operating machinery, night or day, as they also prevent the ability to distinguish the colors in road markings, car brake and indicator lights, and traffic signals. Do not use your SleepWell specs as sunglasses, they must only be worn at night. - Wear your SleepWell specs for 3 hours before bed. - No physical excercise, strenuous activity or excitement. - Sleep in a dark and noise-free room. The SleepWell specs program is easy to follow and takes only 3 weeks for full effect. Every Pair of SleepWell specs come with its own microfibre carry case that doubles as a cleaning cloth. The lenses can also be cleaning with soap and warm water to remove grease and fingerprints, or methelated spirits to remove paints etc. Do not use acetone cleaners.